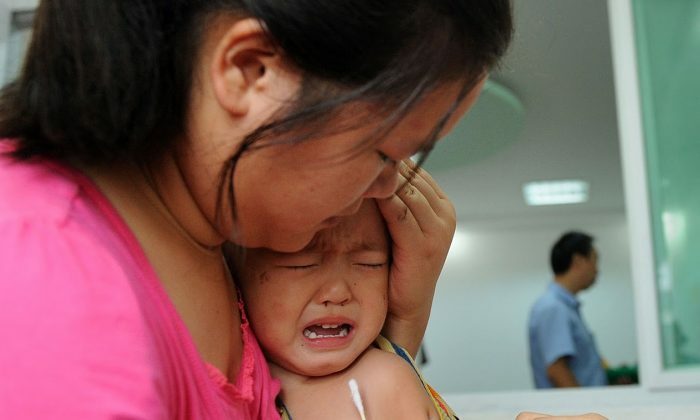 When a massive scandal involving the sale of millions of poorly-stored or expired vaccines took China by storm, a social media group formed to advocate for poisoned victims and their families suddenly gained a huge increase in interest. The founder of the group on the instant messaging service QQ, Yu Tong’an, has been involved in pharmaceutical activism for over a decade, ever since his son’s four limbs atrophied in 2005 because of a faulty vaccine. Yu’s QQ group had over 1,500 members following the scandal that blew up in March. On April 16, Voice of America reported that it was shut down by Tencent, the company that runs QQ, and that Yu himself has been placed under close surveillance by the authorities. Yu speculates that censors ordered his group closed because of a planned gathering and appeal in Beijing on April 17. He was under surveillance by state security when he gave an interview with VOA on April 19. Following the vaccine scandal, thought to be behind the recent deaths of several toddlers, Yu Tong’an’s QQ group attracted a flood of concerned parents looking to share their experiences and find trustworthy lawyers. The QQ group’s closure did not deter 400 members, who joined a new one in the days since. Nor did it stop them and Yu Tang’an from taking physical action. On April 17, some 60 parents, frustrated by the inadequate state supervision, gathered at the Beijing No. 1 Intermediate People’s Court to appeal and file a lawsuit against China’s Food and Drug Administration and the National Health and Family Commission. Parents agree that compensation seems to be based on how much effort is put in to have the case addressed. The National Health and Family Planning Commission is responsible for providing vaccination services, but the procedures for reporting malpractice are unclear and characterized by bureaucratic red tape. It’s also difficult to get compensation. Wu, from the impoverished province of Guizhou, visited nearly every local government department with little to show for it, according to VOA. He appealed five times to the National Health and Family Planning Commission five times. In the end, after he went to Beijing, the Wu family was able to receive one million yuan (about $150,000) from the local sanitation bureau, but he is not sure how the payment was authorized. He and other parents of affected children agree that compensation seems to be based on how much effort is put in to have the case addressed. Even by the time one gets compensation, however, it may be too late for the child. Wu’s daughter saw her condition worsen because she was not able to get medical treatment for her nervous system in time. Wu ended up having to spend 20,000 yuan a day for her lengthy treatment. Many families even less fortunate than Wu’s get no help, and their children either perish or must live with crippling disabilities. Moreover, state regulations mandate that the reception of compensation means that the victim has settled the case, shutting out options for further investigation or legal action.